Do you struggle with having the ‘right’ kind of foods stocked in your pantry so that you can easily create healthy meals? Trust me, this will help! Fruit is super important to buy organic because of high pesticide exposure. Therefore frozen can be a more economical choice especially in the winter months. Carrots shredded will be great for a salad, cut longwise makes a great snack, and cut round for roasting. In the ideal world like to buy dried beans, cook a bag full and freeze them or store in the fridge for later use. Canned beans are good choice in many occasions. My concerns with canned foods is: BPA and salt. Many manufacturers use BPA (bisphenol-A) to line the cans and canned foods are usually high in salt. Look for BPA free cans and salt free products. 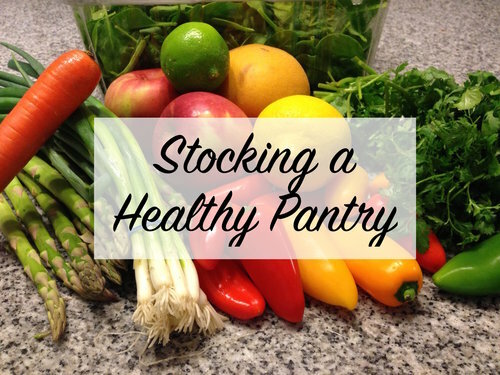 Now, take a look at what you have in your pantry, restock these items that you don’t keep on hand, and whip up a healthy, nutritious meal that is guaranteed to be satisfying! Still have questions or need extra tips? We can help, just reach out!